. Use for learning bear sounds, hunting for bear or scaring off the neighbor kids. 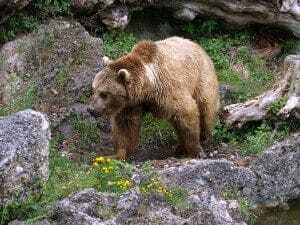 The grizzly bear refers to all subspecies of the brown bear living in North-America. These large animals are apex predators in their habitats thanks to their massive size and strength. Male grizzly bear are larger than females. On average males weight anywhere between 200 and 400 kg, but exceptionally large males can reach almost 700 kg and stand up to 3 meters tall on their back feet. Grizzlies have big and powerful claws, and the strength of their bite is such that it could crush a bowling ball. Although they belong to the Carnivora order, the diet of these animals is largely omnivorous. They are voracious eaters, and their well-varied menu includes fruits, insects, honey, nuts, fresh grass, roots, larvae, all sorts of fish and mammals, birds, etc,. They are even known to prey on the American black bear which is the continent’s smallest species of bear. Grizzlies are generally depicted in popular culture as being impulsively aggressive towards humans, but reality is that these animals generally avoid contact with us preferring to carry on their peaceful lives. Females are known to be highly protective of their offspring and may engage in aggressive behavior if danger is perceived. But grizzly bear always forewarn others about their intentions. They do this through a combination of body language, odor and sound. Grizzly bear employ a variety of sounds to communicate. The meaning of bear sounds is very context specific. For instance, a female can communicate with her cubs through grunts, growls, moans or huffs, but these sounds can mean something very different in other situations. Grizzly bear sounds can be non-voiced like snorts, huffs, grunts or teeth clacking or they can be actual vocalizations. Non-voice sounds are employed far more often than vocalizations. Grunt – A grunt is may be used as a signal of friendliness or command order from a female to her cubs. Popping jaws – This is also done when a grizzly engages in fearful, aggressive of agitated behavior. A female may also alert its cubs through a popping sound. Snorting – Used by agitated, fearful or aggressive grizzlies. Blowing air through nostrils – Same as above. Screams – Used by cubs in distress. Hums – Cubs also hum when content with the nursing of their mother. Bawling – This is done by an adult in pain. Moaning – Adult in fear. Bellowing – Grizzlies rarely engage in bellowing. It is an obvious sign of aggression, and it’s usually done by males competing for females in the mating season. A female may also roar to defend her cubs from perceived threats. , go to main Downloads page and follow information at bottom of page.